10 Ways to Prepare for Purpose Success in 2019. Within the next 5 years, it will become inconceivable that a company will exist for the sole purpose of maximising profit. Companies that are not actively demonstrating they’re shifting their organisation towards a ‘higher purpose’, will simply become extinct. In fact, in the 2015 HBR/EY Business Case for Purpose research, 89% of the 474 executives researched stated they understood the importance of purpose, yet only 46% said their company actually had a strong sense of purpose. That’s a huge gap to be seen as either a tough challenge or a brilliant opportunity. We’re now witnessing big companies like Unilever, LinkedIn and Patagonia leading the way on purpose. And they’re challenging other leaders to get on board, to explore it and plan for it. The very real challenge for most leaders however, is how to do it with honesty, integrity and real impact so as to avoid wasting millions of dollars and being put in the ‘purpose-washing’ basket. We simply can’t afford to get this wrong. Building a company that’s better for the world, not just the best in the world, is now an imperative for a sustainable future. We must all do this together to create a global purpose movement. Many companies are taking the traditional approach to purpose by spending millions of dollars on expensive consulting firms and ad agencies to roll-out purpose initiatives. I’m a champion of starting with a more pioneering approach, one that will prepare you for success, way before you start spending money on it. So, if you’re serious about going on the purpose adventure in your company, here are my top ten recommendations on how to prepare for it. It takes one courageous leader to start a movement but it’s the followers that make the movement. The point of a movement is that no one is coerced or told they must get on board. People join the movement because they’re intrinsically motivated. They want to be a part of something that’s bigger than them. So how might you start a purpose movement in your company? Action: Watch this 3-minute TED talk by Derek Sivers ‘How to start a movement‘ for some inspiration. In any executive leadership team there will be the purpose naysayers, those that will always prioritise profit. Don’t let these people railroad your attempt to bring purpose to life. Engage the executives that care most and give them full support and the authority to have quality purpose conversations with others. Read about how to deal with purpose sceptics here. Action: Make a list of the purpose champions and sceptics in your team and consider what approach might work for each one. There’s an increasing body of evidence demonstrating the imperative of purpose. It’s worth digging into and preparing a summary of the findings and their relevance to your company. Take every opportunity to share this evidence whether that’s in a casual conversation or a formal presentation to the board or execs. So, what are the top five findings that prove the imperative of purpose for your company? Action: Start by reading the research here and commit to preparing an executive summary to present to your team. Purpose is not about philanthropy or CSR. It’s about creating an entirely new ‘reason for being’ beyond profit that will become the fabric of your company. Purpose success requires a real understanding of what you’re up against. Educate everyone, not just the leadership team. Read widely on the topic. Study the companies that are doing it well (and not so well). What learning on the subject of purpose is needed by your people? External parties such as ad agencies, consulting firms and coaching companies certainly have their place, but the full engagement of a team of experts should not be your first port of call. The deep purpose education and engagement needs to be done internally across, up, down and outside the company first. Start by gathering a core team of purpose-driven people who are representative of all your people. How might you find this core team and start the engagement conversation? Action: Take your company’s temperature with our complimentary Purpose Health Check (Email us to coordinate the set up for your company). Your purpose philosophy and approach should be informed through engaging with other leaders outside your company. Connect with, and learn from, your purpose-led customers, suppliers, entrepreneurs and other business leaders who are already successfully building companies on purpose. You can find them in movements such as B Corp and Conscious Capitalism. How will you get out of your office and get connected to others leading on purpose? 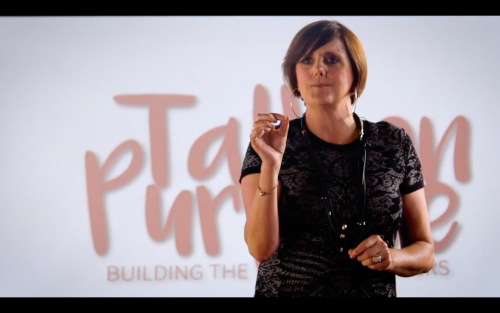 Action: Find and connect with three leaders you admire that are ‘on purpose’ that you’d love to learn from. Purpose doesn’t need hierarchy. It’s not something to be driven from the top down by the executive team. While it’s up to you to enable it, it’s up to your people to co-create and co-activate it. If your people have a hand in it, they’ll take ownership of it and responsibility for it. Take a courageous and highly curious approach by ensuring those that care, can speak up and take action in their daily work and projects. What does a co-created and co-activated purpose look like in your company? Action: Start the conversation with your internal culture/learning/HR and OD people to explore how a co-created approach might evolve in your workplace. It’s estimated that in any company, there are up to 20% of people (your potential purpose activists) at most risk of leaving. They’re hungry for your company to have a purpose beyond profit, they’re looking for jobs at purpose-led companies or they’re considering starting their own small business. These are the ones you most need to retain to lead your purpose movement. Read more about Purpose Activists here. How can you find them now, before they escape? Action: Send out a call for these people to come meet with you via your intranet or other communication platforms. Most company’s prioritise organisational purpose as the basis for motivating people to turn up to work as happy, engaged and productive employees. The vital missing piece in the purpose puzzle, however, is how we help our people find their own purpose so they can bring their whole-self to work. A deep sense of personal purpose while working towards ogranisational purpose has the power to transform cultures. So, how intrigued and committed are you to explore your own purpose in your work? Action: Experiment with the ‘ikigai’ purpose model in the sample of The Purpose Project here and start exploring your own purpose at work. 10. 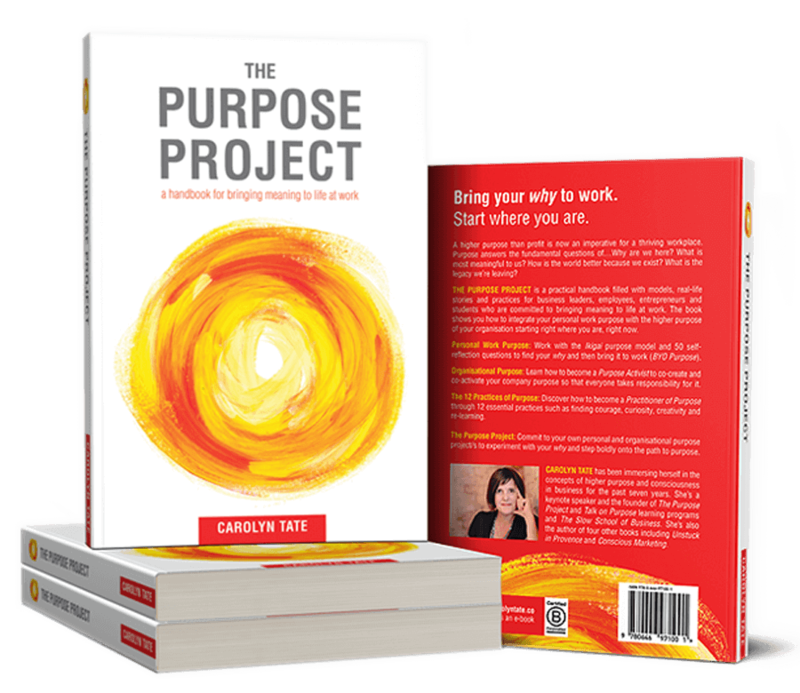 Give the gift of purpose to your people, buy them a copy of The Purpose Project! The Purpose Project is a practical, how-to handbook filled with models, exercises and real-life stories to help you start your own purpose movement. It’s a low-cost, high-impact way to start the purpose conversation in your company to get your leaders and purpose activists feeling engaged and educated on purpose. 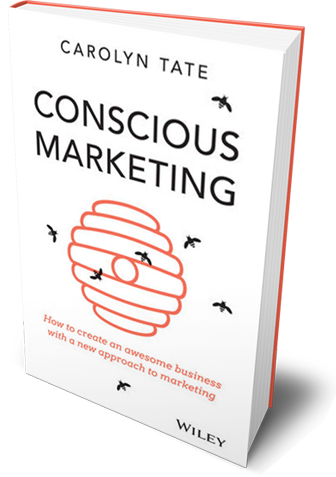 Action: If you’re the decision maker, buy the book for your company or team (see how below). If you’re not, who is? Make a time to meet with them and come prepared with the tools and resources from the tips above. 11. A final bonus tip. Start the purpose conversation with your loved ones, now! Bringing your own purpose and passion to the workplace is vital, but what if we started the conversation with those we love outside of work too – our partner, kids, friends, community? The movement goes beyond the workplace. How can you contribute to the wider conversation to be part of something bigger than yourself that has the potential for global impact? Action: Think of 10 people you care most about and consider how you might start the purpose conversation with them. 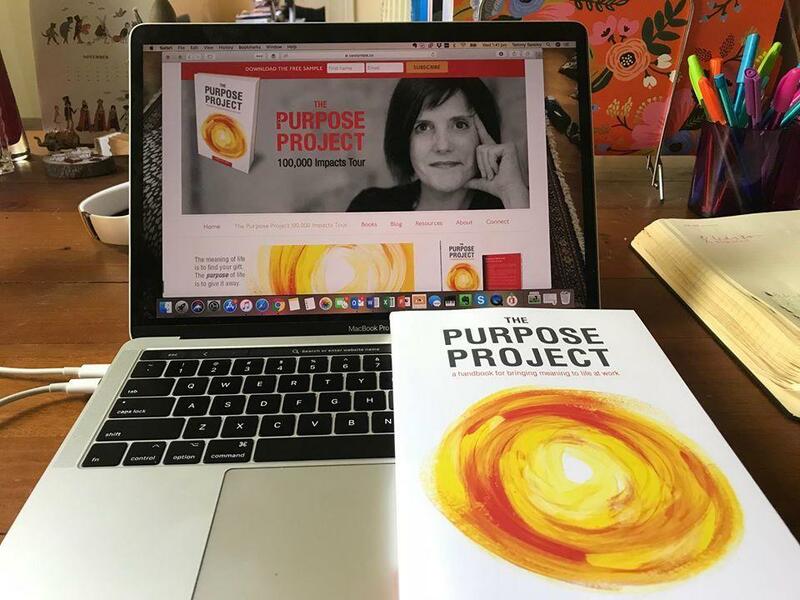 Please join the purpose movement with me and buy bulk copies of The Purpose Project to share with your co-workers, family and friends or your business and book club buddies. There are some very special pricing offers and bonuses for orders of 10+ books including an e-journal. Are you ready to start your purpose adventure? Who am I and what do I know about purpose? I’ve been studying purpose for the last eight years as the core premise of both the B Corporation and Conscious Capitalism movements. I’ve also been bringing it to life in my own startup business school and through various other projects, including The Purpose Project. I’m no purpose guru. I’m a 20-year veteran of banking who suffered through many corporate change/culture programs before I quit to start my own purpose-driven business, so I know from personal experience about people who flee to find purpose. And now after 16 years as a small business owner and author of five books, I’ve experimented, prototyped and tested purpose to the max. As a result, I have a realistic, humanistic, practical approach to purpose that offers companies a cost-effective way to bring purpose to life. Email carolyn@carolyntate.co or phone +61 412 806 950.